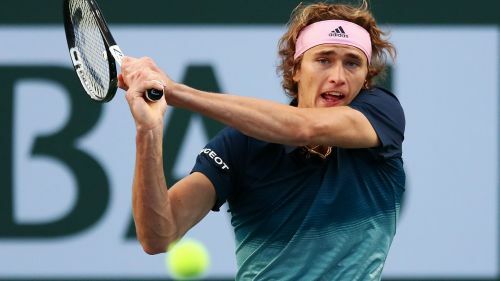 Alexander Zverev joined Novak Djokovic in the Indian Wells Masters third round as a trio of talented youngsters bowed out on Saturday. Zverev, the third seed at the ATP 1000 event, was on court for less than an hour in the second round. A five-time champion at Indian Wells, Djokovic was pushed early before getting past Bjorn Fratangelo. But the anticipated showdown between Djokovic and Nick Kyrgios will not happen after the Australian lost, along with Stefanos Tsitsipas and Borna Coric. Zverev was leading Martin Klizan 6-3 2-0 when the Slovakian retired after less than an hour on court. The German had already broken four times and was in complete control before Klizan called it quits. Zverev will face compatriot Jan-Lennard Struff, who overcame lucky loser Ricardas Berankis 3-6 6-3 6-2. In action for the first time since winning the Australian Open, Djokovic claimed a 7-6 (7-5) 6-2 victory over Fratangelo. The American was up a break in the first set and also ahead in the tie-break, but he was unable to deny the world number one. Djokovic may have been expecting to next face Kyrgios, but the Australian was one of seven seeds to fall. Coming off an impressive title win in Acapulco, Kyrgios went down to German veteran Philipp Kohlschreiber 6-4 6-4. Tsitsipas, the Australian Open semi-finalist, fell to in-form teenager Felix Auger-Aliassime. A runner-up in Rio and quarter-finalist in Sao Paulo, Auger-Aliassime, 18, claimed a 6-4 6-2 win over ninth seed Tsitsipas. Coric, the 11th seed, was beaten by fellow Croatian Ivo Karlovic, the 40-year-old serving 20 aces in a 6-4 7-6 (7-2) win. There was better news for seventh seed Dominic Thiem, who was too good for Jordan Thompson 6-4 7-5.